The Poor People's Campaign was organized by Martin Luther King, Jr. and the Southern Christian Leadership Council (SCLC). Its primary goal was to address issues of economic justice for the nation's poor. The Campaign originated in Mississippi and was to culminate in a major march in Washington, DC. Martin Luther King, Jr. was assassinated on April 4, 1968, but the campaign continued under the leadership of the Reverend Ralph David Abernathy who also assumed the presidency of the SCLC. The Poor People's Campaign, with only 7000 participants, arrived in Washington in May 1968 and for the next several weeks attempted, unsuccessfully, to secure an "economic bill of rights" for the nation's poor. It was during this period that the campaign erected "Resurrection (tent) City" on the Federal Mall. 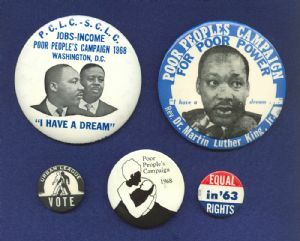 Depicted here among the 1968 Poor People's Campaign buttons are Martin Luther King (1929-1968) and Ralph David Abernathy (1926-1990). Other buttons on this page include a 1963 button encouraging equal rights and a 1960s era button from the National Urban League encouraging people to vote. The National Urban League has its roots going back to 1910 with the founding of The Committee on Urban Conditions Among Negroes. It then became known as The National Urban League in 1920. Text from over forty years of notes, newspaper and magazine clippings, flyers, and other sources associated with the collecting of buttons and used in the research of the 2003 political history poster entitled, "Buttons of the Cause, 1960-2003: The Events, The People, The Organizations, The Issues".